Thanks so much to Flatiron Books for this copy in return for my honest opinion. After reading The Dry last year and loving it, I was beyond excited to get book 2 in the Aaron Falk series. An atmospheric thriller from Australia that should be on your TBR. Five women go into the woods for a corporate retreat and team building. Only four come back. What happened in the short time they were out there? Aaron Falk is back and after a mysterious phone call from the missing woman, Alice, is determined to figure out what happened and find her. Here's the thing with Harper - she really knows how to bring you an atmospheric thriller. 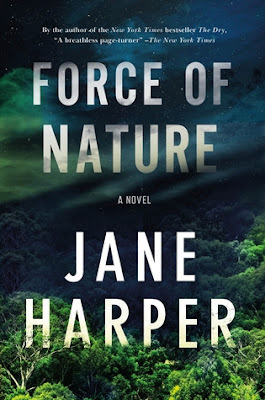 I fell in love with her writing with The Dry last year and was so excited to see Force of Nature come out. I actually preferred this story to The Dry for the most part. This novel takes you back and forth between the experiences the women had while in the woods for the retreat and to present day with Aaron on the case. The woods are always a scary place. So easy to get lost in. The unknown of what could be out there. How quickly the elements can turn against you. If you don't know how to take care of yourself, the odds are pretty stacked against you! I did want a little more of Aaron - we got a little bit more on his background and I'm curious to see where his relationship with Carmen goes. I'm sure we will get more into his past and character study as the series progresses. The book starts with a pretty ominous feel and that decreases as the book continues which did cause me to lose a tiny bit of interest as I read. This book doesn't provide any huge twist or come with much of a shock value. However, what makes it SO GOOD is her writing. I felt like I was in the woods with these women and really, I'm so glad that I wasn't because boy are these women not the greatest bunch. Of course, tensions run high when you realize you're lost with a bunch of women you don't particularly care for and with no sense of help coming. How do you think you'd be in a situation such as this? A fantastic read and a series I would highly recommend for thriller/crime lovers. I always like to read series books in order, but this can definitely be read as a standalone with no issue at all. I'm keeping my eyes peeled for more from Jane Harper. A thousand percent will be continuing this series. 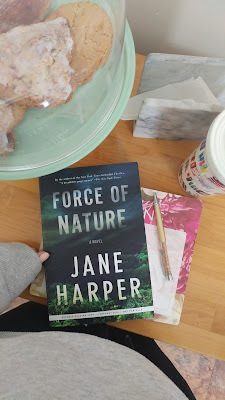 Last year the #cjsreads trio read THE DRY (it was actually the first book we did together), so when we saw that Jane Harper was releasing her sophomore novel, and the second book in the Aaron Falk series, we had to read it! Five colleagues go on a hike as a corporate retreat, but only four return. These five women have complicated relationships - both professionally and socially - so we're all left wondering about what truly happened deep in the forest. Federal Police Agent Aaron Falk is very interested in this case and wants to find the missing hiker. Is Alice simply missing or is this a murder case? This story is told through two perspectives - flashbacks to the hiking weekend and then present day during the investigation. Aaron Falk is back and I was so ready to dive into his next case. We also are introduced to his new colleague, Carmen. She adds an interesting element to the story, as she was previously investigating the company before Alice's disappearance. 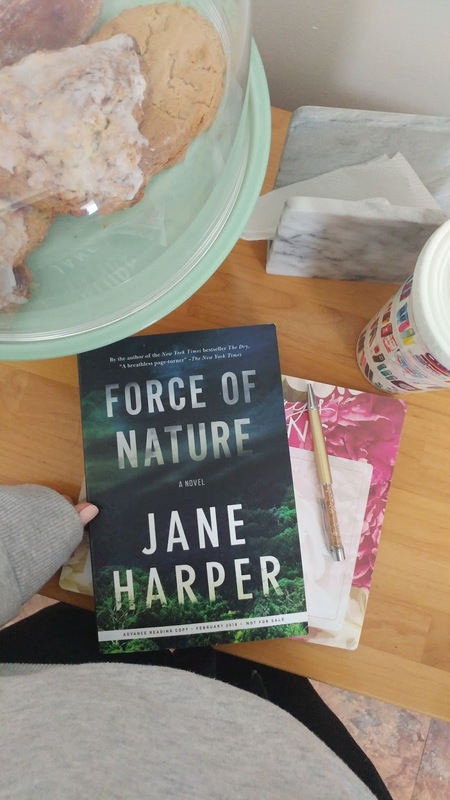 Just like with THE DRY, Jane Harper weaved us a suspense where it was near impossible to figure out the ending beforehand. There were so many elements and questions that continued to be introduced throughout the investigation that there were so many potential reasons for Alice's disappearance. There was an added layer of suspense when Aaron and Carmen were taken off the case as the lead investigators. So they had to rely on the information from other detectives - which of course turns into them not having all the information. One other element to Harper's writing that I admire is how effortlessly she sets the scene. THE DRY had a hot, barren, and hopeless feeling landscape while FORCE OF NATURE has the reader smack-dab in the middle of a wet, humid, and overpowering forest. I love when authors can instantly transport you to any destination within a few pages. This could definitely be read as a standalone, so if you're wanting to dive into this one without having to read book one, go right ahead! After huge debut successes, I'm always anxious going into the sophomore novels because you don't want to build it up too much in your mind, but it's so hard not to. 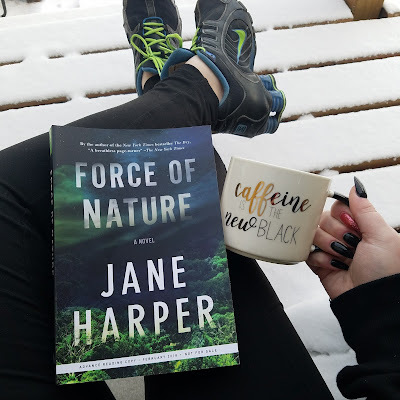 Jane Harper did not disappoint in book two and I can't wait for more Aaron Falk. 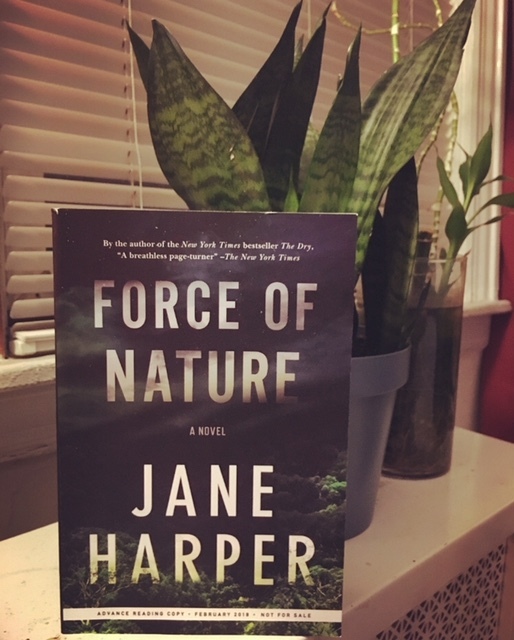 Last year, when the #cjsreads trio was formed, our first novel was The Dry by Jane Harper which was an atmospheric thriller starring Federal Police Agent, Aaron Falk. Pretty much as soon as we finished reading, we unanimously decided we needed more of this series and our dreams came true with Harper’s sophomore novel, Force of Nature. This novel follows Aaron Falk and his partner, Carmen, as they investigate a missing informant from their latest investigation into some corporate money laundering. A group of five ladies went into the woods, four came out and the only one missing is the whistleblower set to testify against her employer and colleagues. There is doubt that betrayal and deceit was present in this workplace but could have led to murder? From the first pages, when the women emerge from the wilderness missing a member of their crew, it had a The River At Night by Erika Ferencik vibe and I was all about this. I am not a nature girl myself so anything have to do with people fighting through the elements and batting mother nature totally creeps me out. Adding the extra layer of personal relationships and the struggle of who to trust was icing on the cake for me. I think one of my favourite features of a Harper novel is the atmosphere. She does such a fantastic job at creating the setting as an entire character and throughout my reading I couldn’t help but feel fascinated by how INVESTED I was in the descriptions of the bushlands. There is no doubt that Harper’s prose excels in this landscape. Told back and forth between the women in the bush, fighting for their lives and trying to survive, and Aaron Falk with Carmen, investigating in the present was entertaining even though I didn’t find there too be very many twists and turns. It was a very straightforward story: this is who went missing and this is why it happened. Very blunt. No time wasted. Overall, did I enjoy this novel? Absolutely! Will I read more in this series? Absolutely! Did I LOVE it as much as The Dry? No, but it was still a fantastic read!